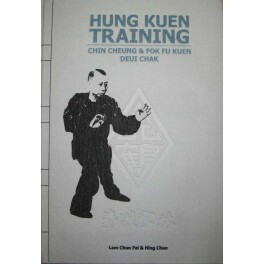 Hung Kuen Training: Chin Cheung & Fok Fu Kuen Deui Chak by Lam Chun Fai, Hing Chao by Hing Chao Lam Chun Fai - Bok Lei Po Trading Inc. The book starts out with an intelligent and intriguing analysis of Hung's origins, much beyond the curt and flimsy histories we have so often read. The writing is excellent with superior English prose. Next is a section on exercises and training methods specific to Hung such as Bridge hands and Tiger Claw. Then more historical writings such as a comparison with the famous Bubishi document. This is followed by a presentation of the Arrow Fist (or War Fist) set with thorough discussion of its past and meaning. Applications are clearly shown at the end of the breakdowns. Next is the rare two-person Gung Ji Fuk Fu. This jumps into it, arm banging and all. The applications are clear and obvious in the set itself but it's only fair to mention that the layout and the photography are both of outstanding quality. A book for any martial artist's library.